During our younger days, we were more focused on bringing up and nurturing our family that included two wonderful sons, never realising that we can develop such an enthusiasm on gardening in our golden years! We did have some garden plants such as orchids, bougainvillea, some foliage plants and a couple of fruit trees then, but not as ‘extensive’ as now. Here’s a pic of our frontyard garden taken in September 2004, just to share with you how it looked two years ago! Enjoy! Like to drop in and say hello. I discovered your website by chance when I was trying to search for a plant’s name which was given to me by a friend. I really like your website and the passion you have for gardening. You have such a beautiful garden and a lovely family. It’s nice to finally find a gardening website which is so close to home which I can relate to. I’m very new to gardening. I develop the passion only about a year half ago. I started with zero knowledge and learn thru the internet and some tips from friends. So I’m still not good at it yet. Well, I don’t think I have the gift for growing things like my grandma but my enthusiam doesn’t waver. And sadly I don’t have much space to expand my garden. So, I’m bursting at my seams. 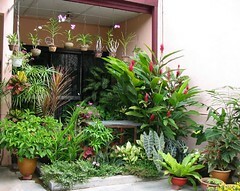 I really love gardening, I spent most of my free time now attending my small garden. I also have other passions which is raring gold fishes in my selfmade pond, doing crafts, sewing my own clothes and cooking. Well I better stop here now and continue my work. Hope to check more of your website in time and maybe chat with you soon. Bye. Way to go, YenLing! With passion and such enthusiasm in gardening, you’ll soon outrun your grandma in skill and creativity! You remind me of myself in my younger days with such passion on handcrafts, sewing and cooking, which has waned over the last decade as I switched towards gardening. Moreover, my children have started their own families and living on their own, hence cooking just for two oldies with much emphasis on health food isn’t as exciting as feeding ravenous teenagers/young adults without restrictions! Do visit more often if need arises. As you’ve mentioned, there’s much garden similarities that you can relate to.